Now that the annual health insurance open enrollment period has closed you can not change your health plan unless you have a qualifying life event. There is a list of 12 total qualifying life events, but many of them occur very infrequently. Of the remainder, some are more common, and we’ll show how you can use these to create a special enrollment period that allows you to change or get new health insurance coverage. This qualifying life event occurs when you leave a job that provides company-sponsored health insurance, or your insurance company terminates your coverage. A key distinction about this event is that it can not be Voluntary. When you quit your job, the company will stop paying for your health insurance, and you will have to choose between COBRA and getting your own medical plan. The company decision to stop paying for your coverage makes this loss Involuntary. Warning! If you accept COBRA coverage, you will NOT be able to leave COBRA until the next open enrollment period. Opting to leave your health plan by not paying the premiums, or by cancelling it, is not considered a Voluntary loss1. This will not create a special enrollment period for you. You will have to wait until the next open enrollment period before you can apply for a new medical plan. This also applies to removing your spouse or children from a company medical plan. To prove this qualifying life event is valid, you need to provide a letter from your employer stating your medical insurance has ended on a specific date. If your insurance company cancels your plan, they will provide you with a letter about it. This letter is your proof. 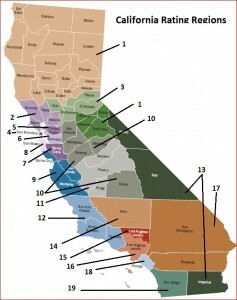 Did You Move Between Regions In CA? If you have recently moved to California from another state or country, this qualifying life event applies to you. The other way this is used is if you move between the 19 regions in California, and your current plan is not available in the new region, or there are new plans that were not offered in your old region. As an example, if you have a Health Net PPO plan and live in San Diego. Moving to Crescent City would create a special enrollment period for you because only Anthem Blue Cross and Blue Shield plans are offered there. To prove this qualifying life event, you’ll need a couple pieces of documentation. This qualifying event is probably one of the most useful life events. It’s also the most frustrating one. You can use this condition if your income changes enough to qualify for an increase or decrease in cost share reduction benefits, or if your adjusted gross income crosses 400% of the federal poverty level. 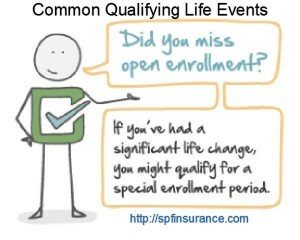 However, you can only use this qualifying life event IF YOU ARE ALREADY ENROLLED ON Covered CA. That’s the frustrating part! As an example, if your adjusted gross income drops from $30,000 to $28,000, you would qualify to change your health plan. This occurs because $28,000 qualifies you for a cost share reduction Silver 73 plan with enhanced medical benefits, while the $30,000 would put you into the regular Silver 70 policy. There are a variety of documents that can be used to prove your income has changed. The most common are pay-stubs, bank statements, and income tax returns. With each of these qualifying life events, you have only 60 days from the date of the event to enroll or change your health plan. This deadline is very firm, so don’t delay. With the Involuntary Loss of coverage, and the permanent move life events, you are also allowed to apply for coverage up to 60 days prior to the event. This change was made to prevent gaps in your health insurance coverage. The primary thing to do is get started collecting your supporting documentation. Once that is ready, you can begin the process of changing your health insurance. Check to see which networks your doctors are in by searching for them in the provider directory search tools located here. Determine if you can qualify for subsidized coverage based on your adjusted gross income. Run a health insurance quote On-Exchange or Off-Exchange and tell the quote engine what you expect your 2015 income to be. Select the plan that best fits your needs. Check here for descriptions of the Bronze, Silver, Gold, and Platinum policy benefits. Apply online for your new health insurance using the green “Apply Now” button in the quote. If you are subsidy qualified, call us and we’ll help you correctly complete the Covered CA application and qualifying life event information. Just because the open enrollment period is closed, does not mean you can’t get new medical insurance. You just have to know how, and IF, it is possible based on your life events. Let SPF Insurance help you through those questions. 1 Look for an upcoming post that will show how you can opt out of group health insurance plans and still qualify for individual coverage on or off the Covered CA exchange.